It is a long lasting 16 km journey. 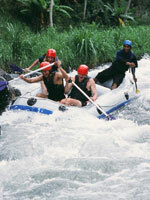 Bali Activity Experience an exhilarating and exciting white water rafting on Telaga Waja River passing through small drops and a number of rapid runs. 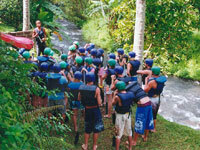 The guests will receive all necessary instructions and briefing from professional river guides. 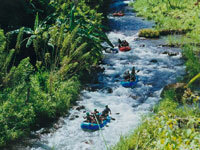 Rafting adventure includes return hotel air-conditioned transfers, shower room, changing room facilities, etc. Drop at the office of international rafting company on the way, finish payments and check-in. 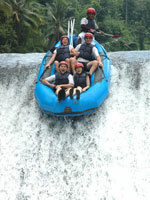 Fill out the form and drink mineral water.（For the guests stay in Ubud area check in at rafting receptionist）. （About 5 minutes after start）Meet drop and get down the boat for a moment, down the steps then get on the boat again. 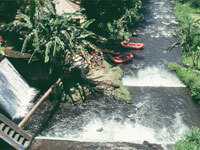 （About one hour after start）Take a at river bank where the rafters can enjoy a spectacular waterfall scenery. 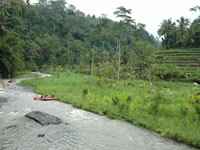 ※Bali International Rafting, Telaga Waja Adventure and Bali Rafting take a break at the same place. ・Give (life jacket, helmet, oar, etc) back to the rafting company. ・Go up 100 steps to the restaurant. Take towel, goods etc. ・Toilet and shower room facilities. ・Indonesian Food. Includes coffee, tea, mineral water. 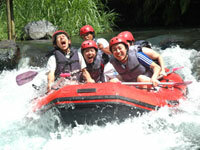 Super package for have fun at mountain, river, ocean in one day! Morning Sea walker in Sanur. Wearing special helmet that you can breathing in the water and walking in under water 30 min. After that lunch buffet then Rafting at Tegalawaja River. starting point Safety Information Thrilling! 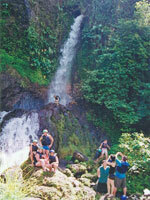 Up and Down… Break time under the waterfall… Here is 4 m Drop-point!! I came to Bali to commemorate retirement travel. 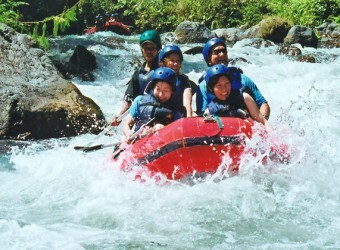 I joined Seawalker & rafting tour. I felt anxious before departure, but it became a fun tour because accompanied by a funny and polite guide.